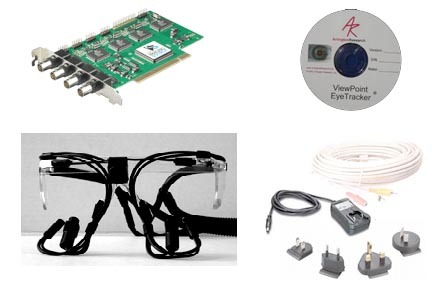 Now scientific researchers and commercial consumer marketing and neuroscience research teams can quickly and easily obtain and analyze complete, precise eye tracking data and physiological data with hardware/software packages from BIOPAC. BIOPAC cooperates with leading eye tracking manufacturers, such as Arrington Research, to offer an array of eye tracking systems that are easily integrated with stimulus presentation, Virtual Reality environments, physiological monitoring, and other media. Combined with BIOPAC data acquisition systems and AcqKnowledge software, eye tracking systems offered by BIOPAC provide extensive acquisition and analysis features that fully support complex experiments. Select systems are also ideal for consumer neuroscience, consumer behavior, neuromarketing and neuroeconomics studies conducted by commercial or industrial research teams. Systems offered by BIOPAC include cables and analog outputs required to interface to BIOPAC data acquisition systems or 3rd-party A/D converters. BIOPAC offers a plug and play integration of physiological signals and eye tracking data captured in the laboratory and during interactive real-world tasks. Integrated data acquisition is made simple. The Hardware can be easily connected, experiment design and analysis do not require programming skills. BIOPAC and iMotions have formed a strategic partnership to give commercial, industrial, & academic researchers worldwide the ability to elevate their research by combining BIOPAC’s best-in-class MP150 hardware and AcqKnowledge software with the leading iMotions Biometric Research Software Platform. These solutions offer integrated, proven, high-quality data acquisition and analysis solutions delivering the physiological data necessary to test and validate marketing and product design decisions. These solutions can complement traditional behavioral study methods—such as surveys or questionnaires—or stand on their own. Learn more about the partnership and solutions here. Synchronizing Eye Tracking & Physiology Data video shows fully mobile subject with SMI Eye Glasses with wireless BioNomadix Logger & Transmitters. Importing BeGaze Data video shows how SMI Eye Tracking data can easily be imported into AcqKnowledge software. Integrating Eye Tracking Data & Physiological Measurements webinar replay with use cases from SMI and BIOPAC.